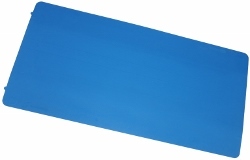 The SlimLine A5530 is an ultra-low profile ground mat antenna. Its total thickness is just 12 mm. Two versions are available, one for the (ETSI) 864 MHz – 869 MHz band and one for the US (FCC) 902 MHz – 928 MHz band. It can be used for UHF RFID applications optimized for moving products or assets, in particular where side antennas are unsuitable. Its rugged, durable design is suitable for industrial applications.